At last, it can be revealed! 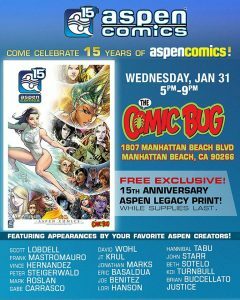 Next Wednesday, we'll be celebrating 15 YEARS OF EXCELLENCE with ASPEN COMICS! Nearly every creator who's talent has graced their pages will be here will be here to meet and greet the fans, sign autographs and there may even be some sketches and commissions happening! There is an awesome FREE LIMITED EDITION PRINT available to the first 100 people to arrive and, word has it, FREE TACOS and drinks! We consider the gang at ASPEN a big part of our Comic Bug Family and we are honored that they chose our spot as the place to launch their 15th ANNIVERSARY TOUR. There are some pretty big things on the horizon for them! Stay tuned! Oh, and take a moment to check out that line-up of talent coming to represent!!! Unfortunately, Siya is too far away to make it to this event, but I'm sure she will be appearing here later this year! Scott Lobdell, Frank Mastromauro, Vince Hernandez, Peter Steigerwald, Mark Roslan, Gabe Carrasco, David Wohl, J.T. Krul, Jonathan Marks, Eric Basaldua, Joe Benitez, Lori Hanson, Hannibal Tabu, John Starr, Beth Sotelo, Koi Turnbul, Brian Buccellato and Justice will ALL be onhand to ring in 15 years of awesome ASPEN COMICS! Don't miss it!!!! It's the biggest single signing The Comic Bug has ever done!